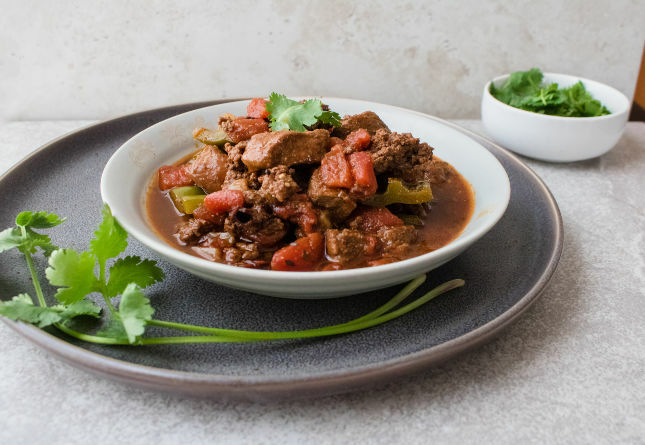 You can never have too many quick and easy recipes in your arsenal of go-to weeknight meals, the type that can be made from memory when you’re too tired to think. It doesn’t get much easier or tastier than our Garlicky Roasted Shrimp and Swiss Chard, a recipe with very few ingredients and a simple one-pan cooking method that makes getting a healthy meal on the table a cinch. Roasting the shrimp and the chard in the same pan not only makes washing dishes quick work, it also cooks both to tender perfection. Roasting greens in the oven keeps them slightly crisp rather than giving them the limp texture that sautéed greens can have. In the oven, the edges of the Swiss chard become brown and crackly and the center of the leaves are tender but not soggy. The trick to cooking the Swiss chard perfectly is using a cookie sheet or a baking pan with only a small rim; if you use a roasting pan or baking sheet with a deep rim, moisture will become trapped in the pan and make the greens too soft. Spreading the raw greens out on a large sheet pan to cook is also easier than trying to stuff them into a sauté pan on the stove, which forces you to cook the greens in batches so the leaves don’t spill over the sides. Oven-cooked greens also require very little attention, just one stir during the 10-12 minute roasting process. 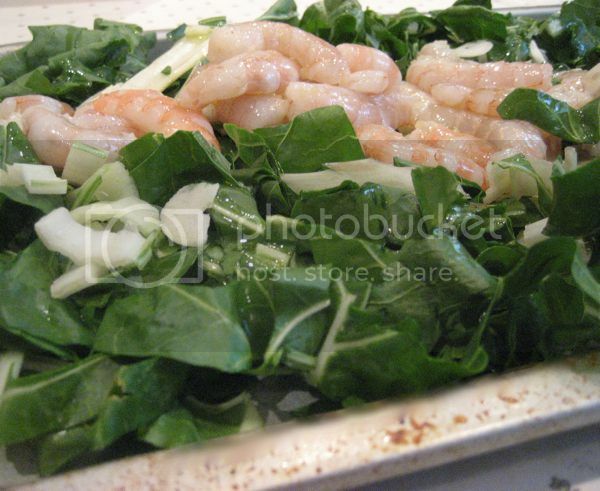 In the oven with the greens, the shrimp become plump and juicy. Fresh shrimp have a slightly sweet flavor that needs little more than olive oil, garlic and salt for seasoning. Frozen shrimp tend to be bland and often need more kick, in which case you can add spices such as cumin, coriander and paprika before the shrimp go in the oven. In either case, we add plenty of garlic to this dish and leave it in thin slices rather than mincing the cloves. In the oven, the garlic becomes soft and mellow – it doesn’t have the pungent, spicy kick that sautéed garlic has – so if you’re a garlic lover pile it on. The most time-consuming part of this dish is peeling and cleaning the shrimp, but considering how easy the rest of the recipe is, it’s hard to complain. This is a simple meal, but when made with high-quality ingredients it bursts with fresh, satisfying flavor. 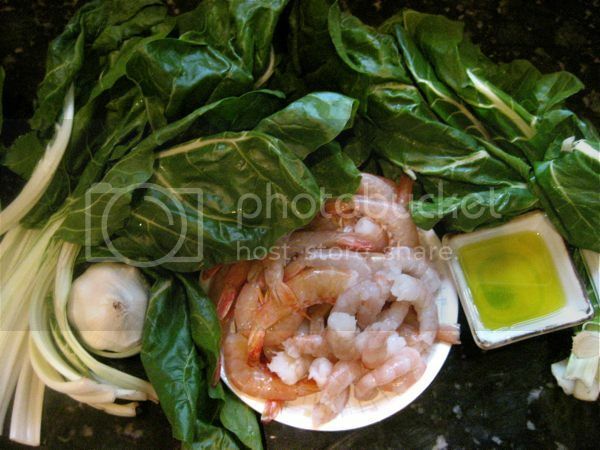 Toss the shrimp and greens with olive oil and garlic. Spread evenly on a sheet pan. It’s best if the greens are in a thin layer, so if you have lots of greens it’s better to use two sheet pans rather than one. Roast for 8 minutes then stir. Roast 3-5 minutes more until shrimp are cooked through. I am definitely going to try this tomorrow night!! I love the way Swiss Chard tastes. Chard is also one of the most nutritious vegetables around so this recipe is a keeper in my book. Thanks for the recipe! Yum! Yum! This is PERFECT timing! You just did a post on Shrimp this week and I now feel safe about buying farm raised shrimp from Costco if its from the US. I am going to the farmers market today or on Tuesday to grab some eggs, tomato plant and…. Swiss Chard Plant!! Yes, we will be growing our own swiss chard plant and I can not wait. So, it may be a while till I make this recipe but as soon as that swiss grows which actually won’t be terribly wrong, I am making this immediately! Careful! Its kind of a winter green. Mine just decided that it had warmed up too much. It doesn’t like the heat and sends a shoot of small leaves up the center instead of big full leaves from the ground as it is supposed to in cooler weather. Does your Costco have USA farm raised shrimp? All I could find in mine was from Viet Nam 🙁 Had to go find some wild shrimp from our local fish monger. Still looking forward to this yummy sounding dish for Memorial Day. Man that sounds fantastic! I can’t wait to make this! Now I’m in the mood for seafood…time to raid the freezer. As a recovering vegetarian I know absolutely nothing about shrimp, could someone tell me what type of shrimp to buy? At Aldi’s they’ve got the in-shell type and the precooked shelled type. I usually buy the precooked just because they are cheaper. Is that fine or would I get better flavor from the in shell, the precooked are pretty bland. Marie…Mark just posted all about shrimp a few posts back. All the info you need. Chard is one of those vegies that grows enthusiastically in most gardens and in many areas will winter over. It is good for having fresh greens in the winter. Made this for dinner tonight. Very easy and very good! My only complaint was that that chard shrinks to nothing when cooked and I would have eaten lots more of it if it was there. If you spread it out on a jelly roll like pan, it gets all crispy and yummy! Great recipe. Do you think mustard greens would work in the same manner or are they just less tender? 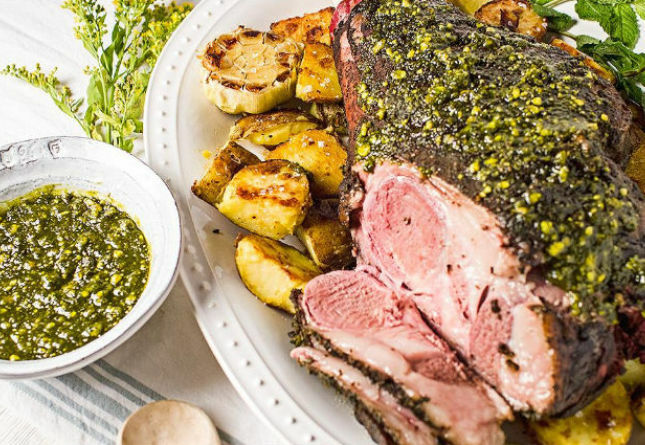 I haven’t tried mustard greens but have roasted kale like this. What the heck, give the mustard greens a try. I just noticed that the swiss chard we planted from seed are up. It has been a very successful crop for the last few years. We cut the stems and it just keeps growing all through the summer up until frost. The ground hogs do not seem to like it either which is a plus around here. thanks for the recipe, daddy grok. shamefully i haven’t got the primal cookbook, yet. but i am scouring the achieves until… this makes it easy. it’s, what’s, for dinner. …but, didn’t you just spank shrimp last week? Don’t even need to bookmark this or write anything down. Fish market or costco… hhhmmm? Made this for dinner tonight – SO good. Thanks for the awesome recipe! Just made this for lunch today for the family, and it was absolutely fantastic! 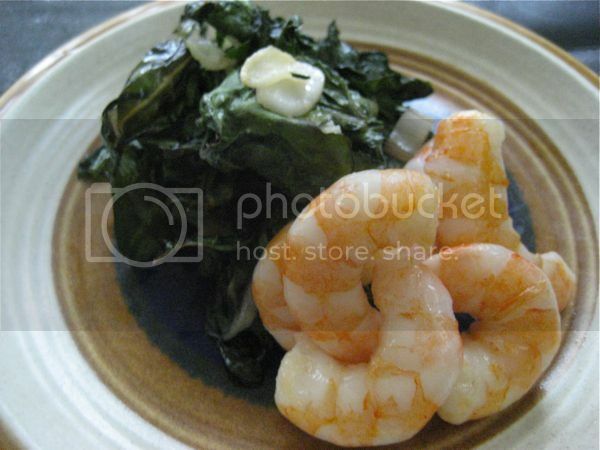 That chard is brilliant, and the garlic, and olive oil with the shrimp … oh, my! Now my whole house smells great! 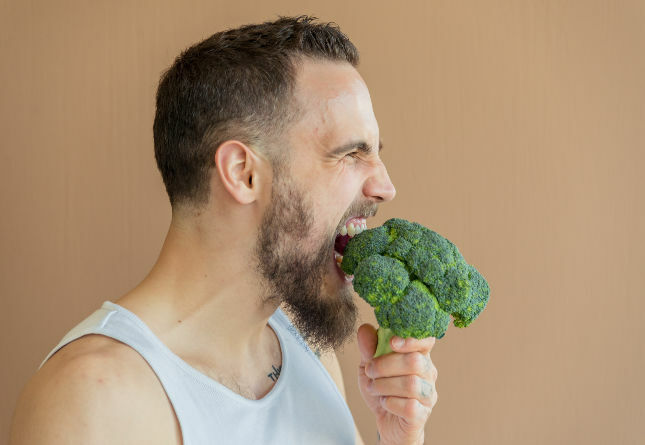 What an easy, delicious, and inexpensive primal meal … I fed 2 adults, an 11 year-old, and a 1 year-old on organic veg and wild shrimp for under $30. Just made this last night and wow! I made this tonight with some baby kale I scored at the grocery…outstanding! 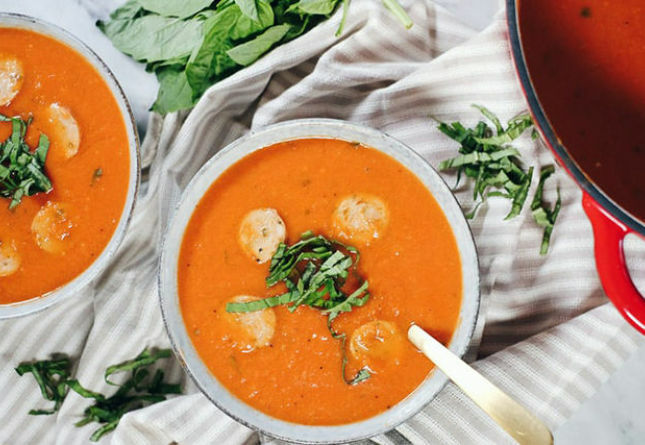 Very easy weeknight meal.